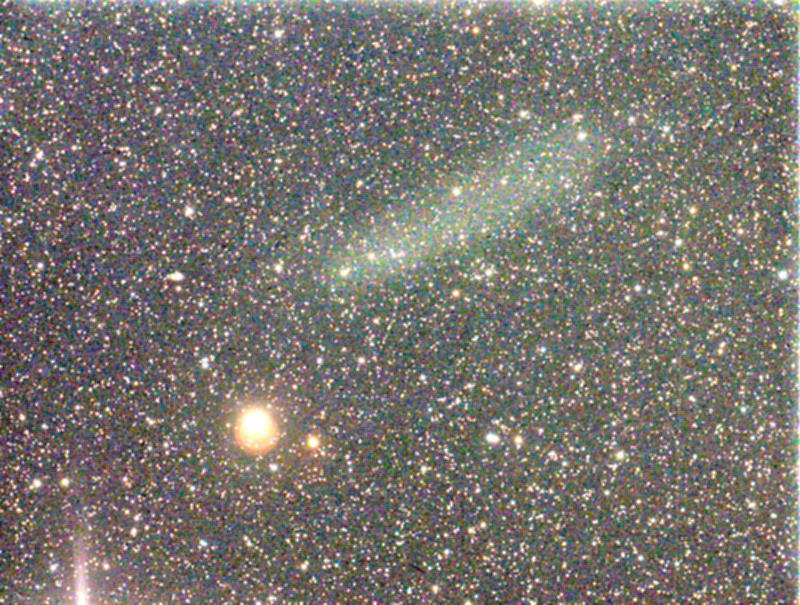 Australian amateur astronomer Terry Lovejoy discovered on Nov. 27.7 his third comet, designated C/2011 W3 (Lovejoy). 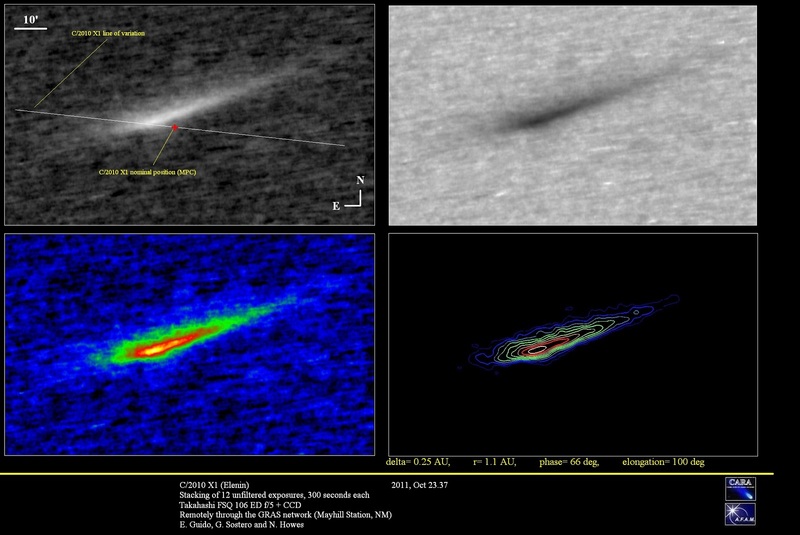 On our previous post about this comet you can see our follow-up image and animation. 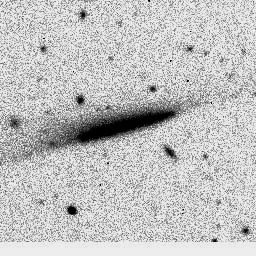 C/2011 W3 is a Kreutz sungrazer, a family of sungrazing comets that are named after German astronomer Heinrich Kreutz who first studied them in the details. 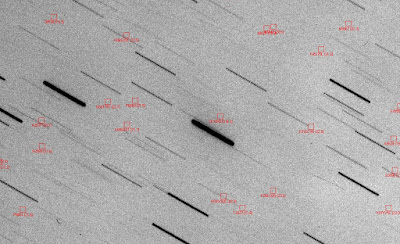 These comet fragments passes extremely close to the Sun at perihelion and usually they completely evaporated during such a close approach. 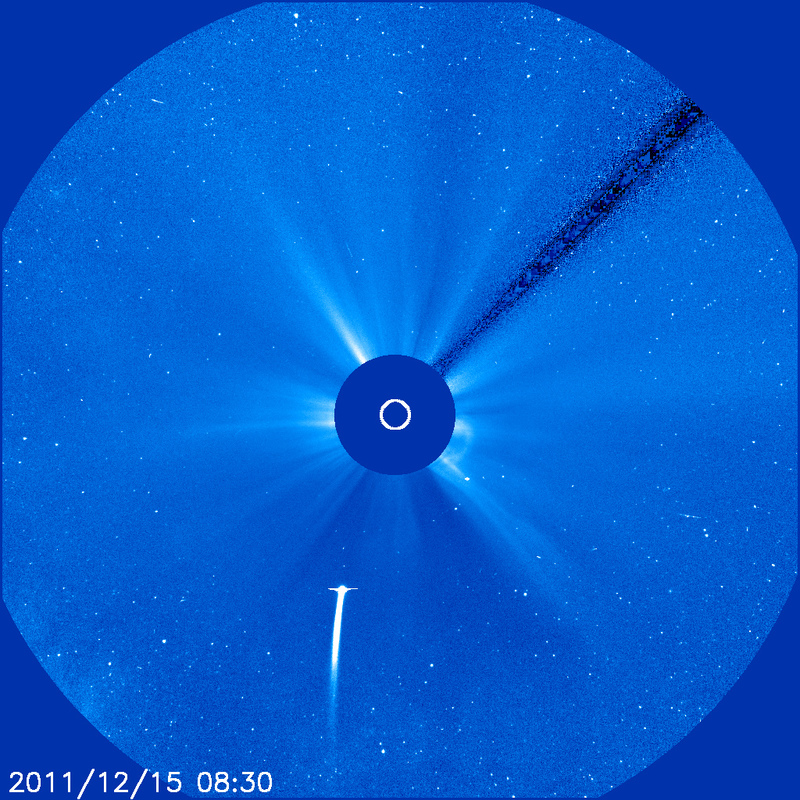 Many Kreutz sungrazer comets are observed each year by SOHO Sun-observing satellite. 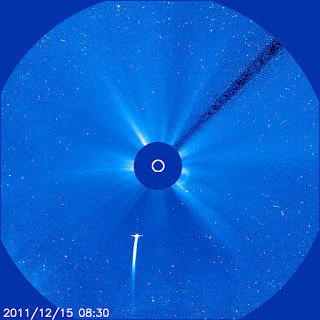 SOHO provides a constant view of the immediate solar vicinity and it has now discovered more than 2000 of new sungrazing comets, some just a few metres across. 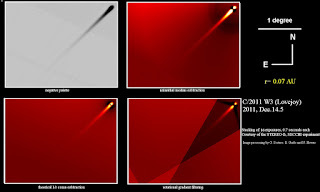 About 83% of the sungrazers found by SOHO are members of the Kreutz group, with the other being referred to as 'non-Kreutz' or 'sporadic' sungrazers (Meyer, Marsden, and Kracht 1 & 2 families). 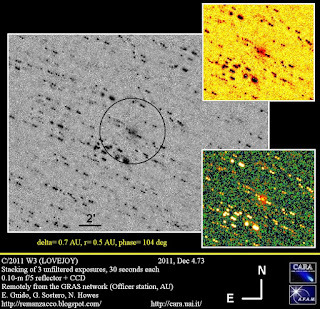 Comet C/2011 W3 will probably be the brightest Kreutz-group comet that SOHO has ever observed. It will reach the perihelion on 2011 Dec. 16.02 when it will be it within 880,000 km of the center of the Sun (the comet will pass just 180,000 km from the Sun’s surface). 3. The comet will enter the STEREO/SECCHI COR-2 A & B fields of view early on Dec 15 (UT time), and the COR-1 fields later that day. 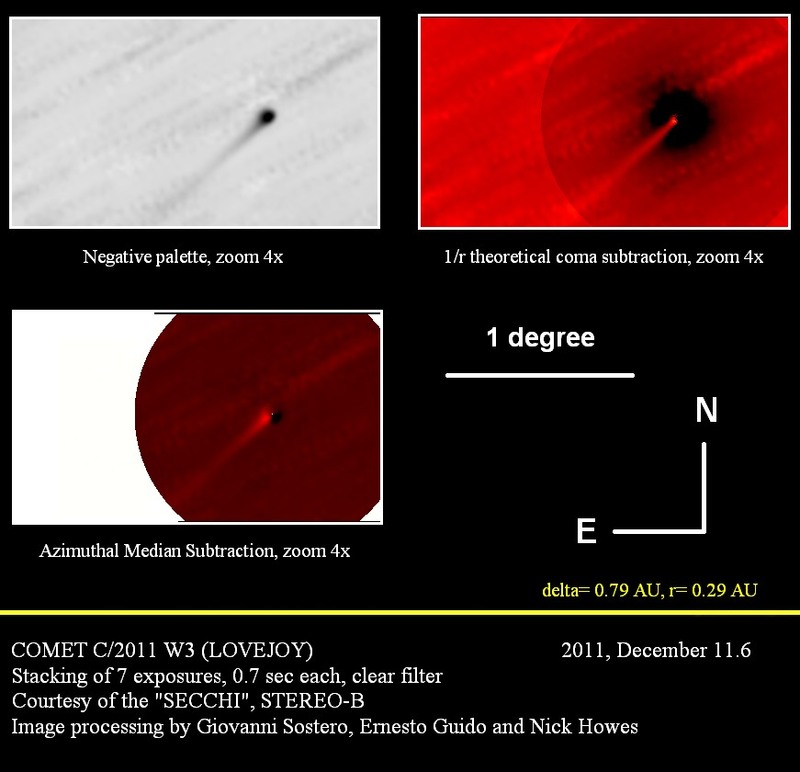 While below you can see an animation showing comet Lovejoy in SECCHI HI-1B on December 11 & 12, 2011 (click on the thumbnail for a bigger version). 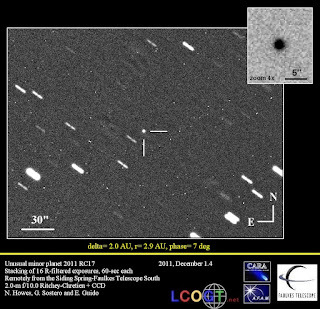 According to Dr. Matthew Knight (Lowell Observatory/JHU-APL), Comet Lovejoy was at approximately magnitude 2.0 as on the LASCO C3 images of 16:32UT, Dec 14, 2011). While the peak magnitude is still uncertain, C/2011 W3 could reach the peak brightness at mag -3 or -4 and the comet will probably not survive perihelion. If Comet Lovejoy gets as bright as magnitude -4 or -5, there is a tiny but non-zero chance that it could become visible in the sky next to the sun. 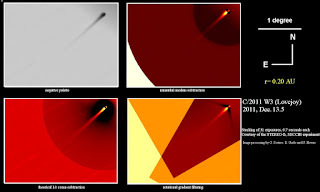 But extreme care is needed due to the comet's small solar elongation angle and close proximity to the Sun in the sky. Stay tuned for more updates coming soon!! 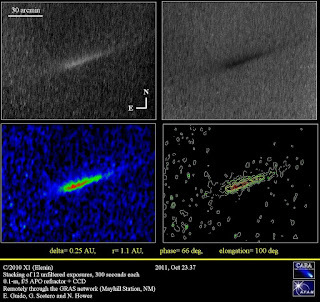 Matthew Knight of the Lowell Observatory and JHU-APL reports on Spaceweather website: "As of 16:30 UT on Dec. 15th, Comet Lovejoy has reached magnitude -3, possibly brighter. It is starting to saturate SOHO images even with narrow filters and shorter than normal exposure times." The comet is now brighter than Jupiter, but not quite as bright as Venus. If these developments continue apace, Comet Lovejoy could become visible to the naked eye in broad daylight before the end of Dec. 15th. Again: extreme care is needed due to the comet's small solar elongation angle and close proximity to the Sun in the sky. Do not look at or near the sun through unfiltered optics; focused sunlight can seriously damage your eyes. 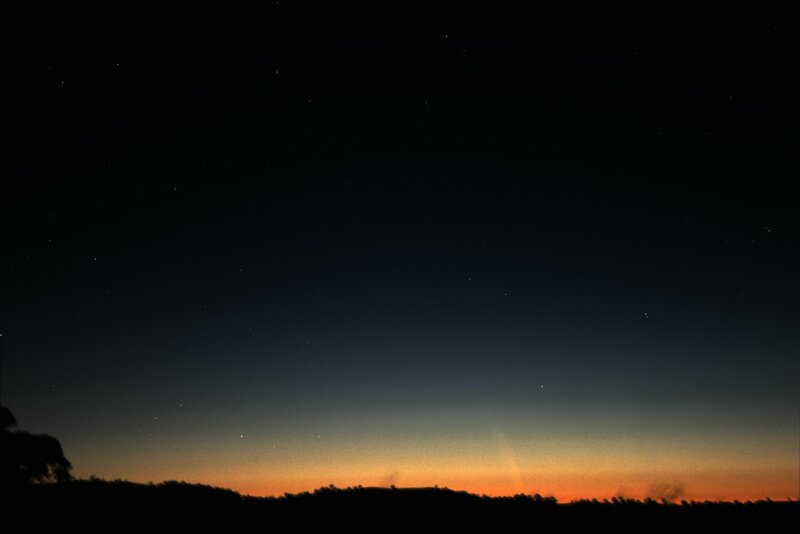 Comet Lovejoy's perihelion is roughly 5 hours from now, on Dec 16 at 00:30UT. Next SOHO images will be available after 22:20UT. 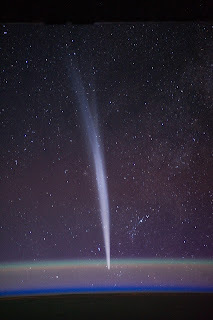 Surprisingly as it may seem, comet Lovejoy appears to have survived its close encounter with the sun. 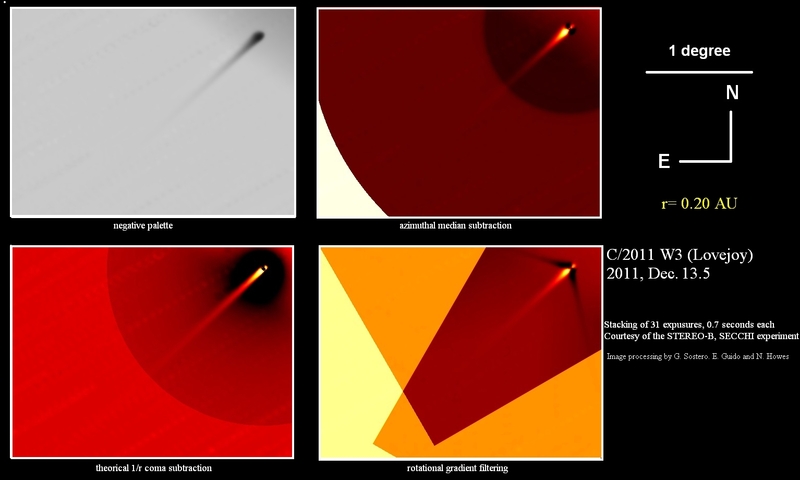 Video and images relased by the NASA's Solar Dynamics Observatory (SDO) caught the comet reemerging on the other side of the Sun after its perihelion!! 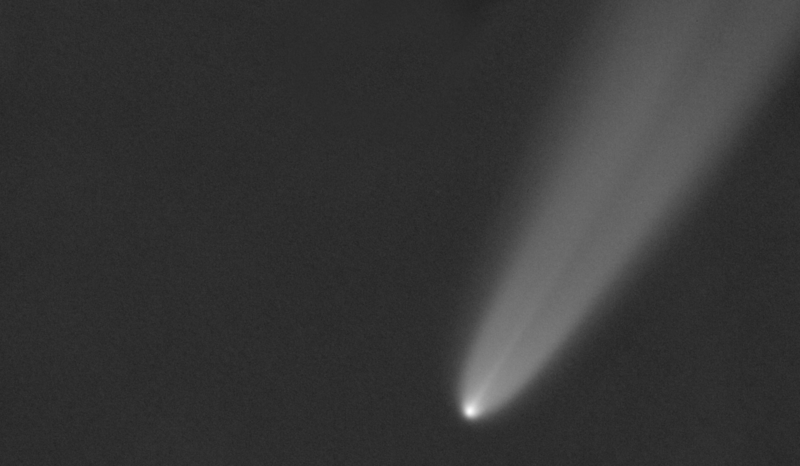 As we saw on the previous update, at first the emerging comet was missing its tail. Now on the latest C3 images, it is evident that tails are forming again (with the inclusion of the very narrow tail we saw just before the perihelion, possibly NA or Fe related) and that the comet is still very bright!! 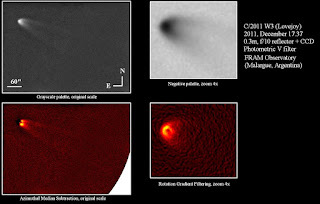 On December 17, 2011 the comet has been imaged in daylight also by amateur astronomer Vincent Jacques of Breil-sur-Roya, France. Images and video below taken with an 80mm refractor at 80x + near IR filter and camera DMK21 from 09:00 UT to 13:00 UT. 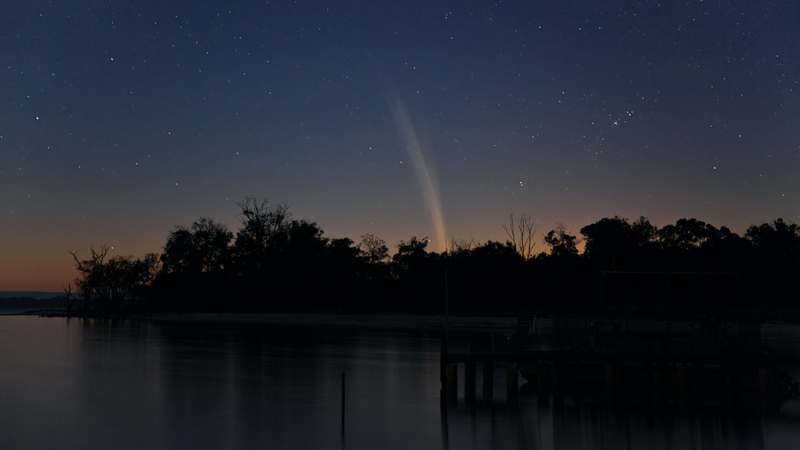 Australian amateur astronomer Vello Tabur captured a 5-degree-long tail of comet Lovejoy on December 19.7 with a DSLR in the bright twilight. Finally a new image by the FRAM team obtained on December 20, 2011 with a 30-cm Meade SCT F/10 (0.66x) located in Argentina, Malargue. The comet has put on a great show for Southern observers. 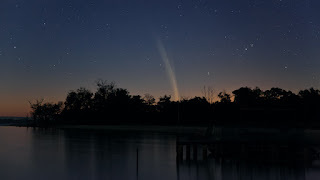 Amateur astronomer Colin Legg has been able to image (with a 5D2 digital camera) the beautiful tail of comet Lovejoy from the Mandurah Estuary on Western Australia around 3:30 WST of December 21, 2011. Below you can see his image and the stunning timelapse of his observing session. 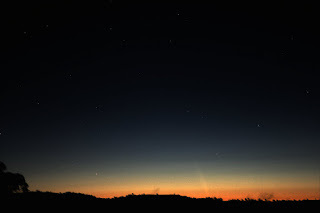 While another observer (Grahame) from Australia took the following image taken on December 21, 2011 at 0400 local time of Perth with canon 7D, 17-85mm lens, ISO 800 F4.5. Click on the image for a bigger version. 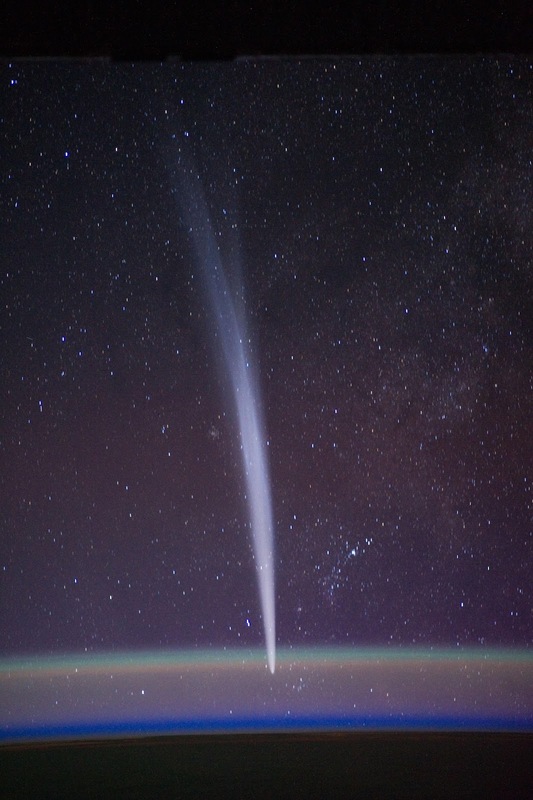 International Space Station Commander Dan Burbank captured spectacular images of Comet C/2011 W3 (Lovejoy) as seen from about 386 Km above the Earth’s horizon on Wednesday, Dec. 21. 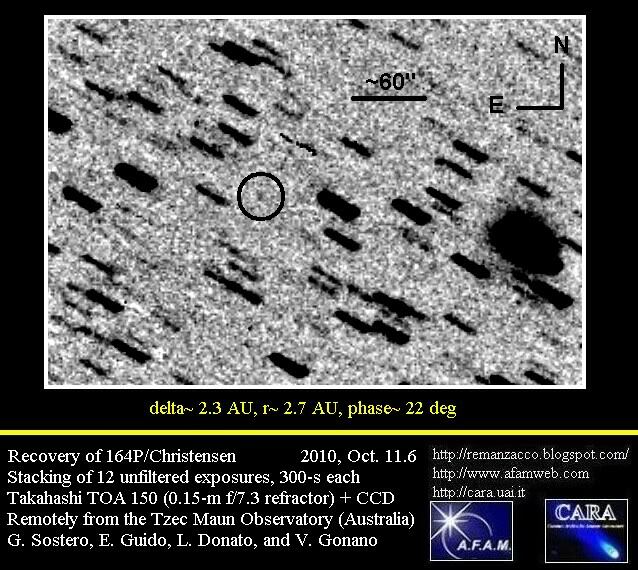 2010 XZ78 is an object found on December 2010 by G96 professional survey and classified as a Centaur. To date, 17 total observations of 2010 XZ78 are present in the MPC database over interval: 2010 11 13.34 – 2011 01 08.25. Centaurs, defined to have their perihelion outside of Jupiter (5.2 AU) and semimajor axis inside of Neptune (30.0 AU), have unstable orbits and have been extracted from the transneptunian objects (TNOs) population through perturbations by Neptune. 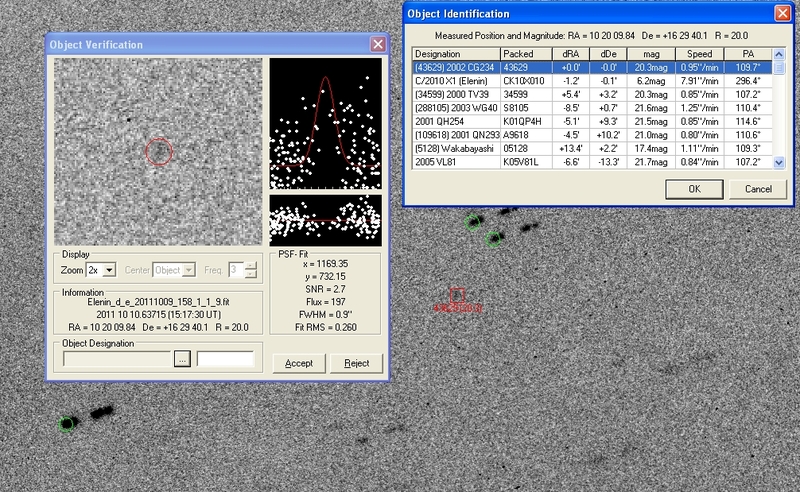 So far only a few Centaurs have presented unambiguous evidence of cometary activity (see for example 174P/Echeclus). 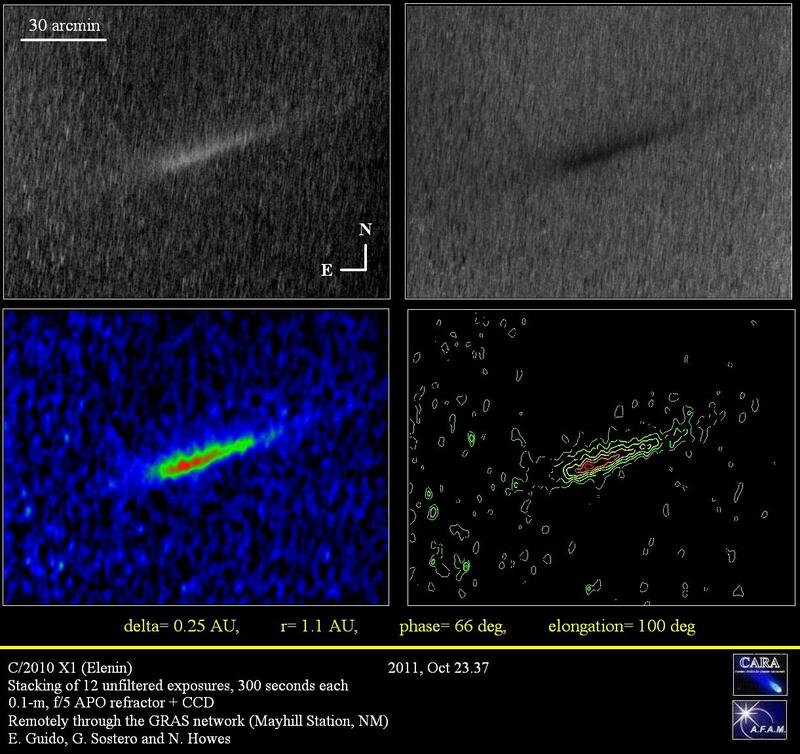 The first Centaur known to present cometary activity was Chiron. 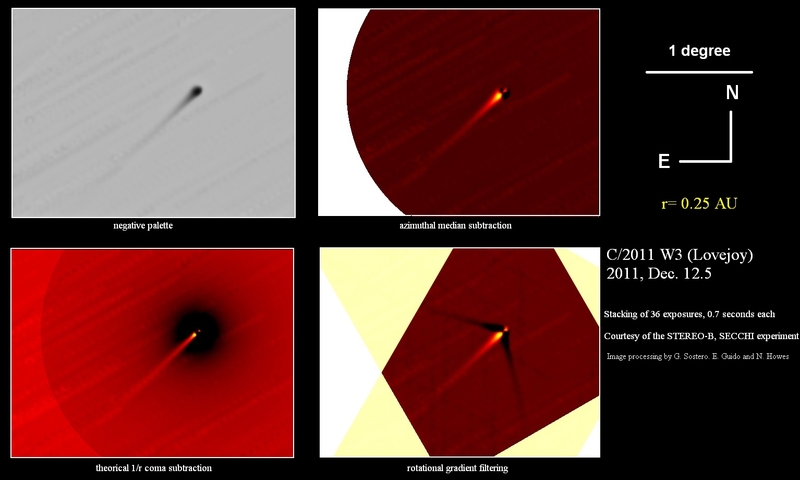 We performed some follow-up of 2010 XZ78 on 2011 December 06, 2011 to lengthen the observational arc and to search for cometary activity. We found it roughly 2.2 arcminutes west of its nominal position. 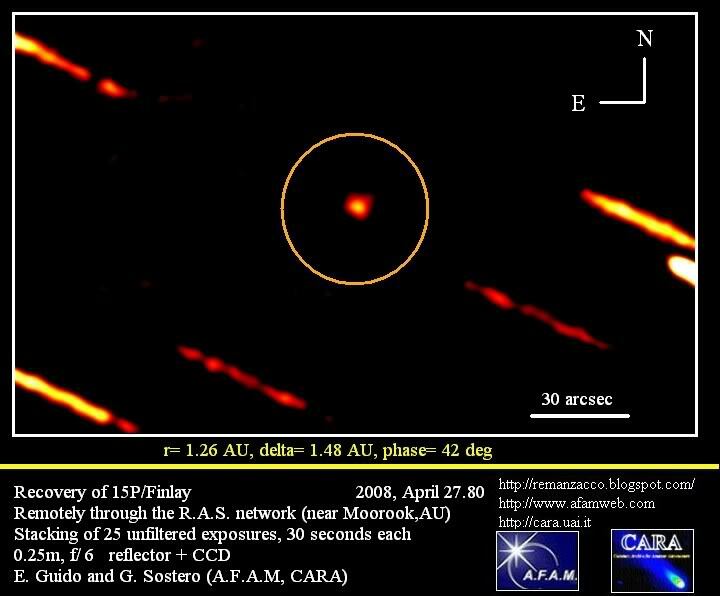 Stacking of 13 R-filtered exposures, 60-sec each, obtained remotely, from the Haleakala-Faulkes Telescope North on 2011, Dec. 6.4, through a 2.0-m f/10.0 Ritchey-Chretien + CCD, shows that this object has a stellar aspect, with its PSF profile being the same of the nearby field stars of similar brightness (FWHM of 1.2"). Cbet nr.2930, issued on 2011, December 02, announces the discovery of a new comet (discovery magnitude 13) by Terry Lovejoy on three CCD images obtained each on Nov. 27.7 and 29.7 UT with a Celestron 8 0.20-m f/2.1 Schmidt-Cassegrain reflector (+ QHY9 camera). 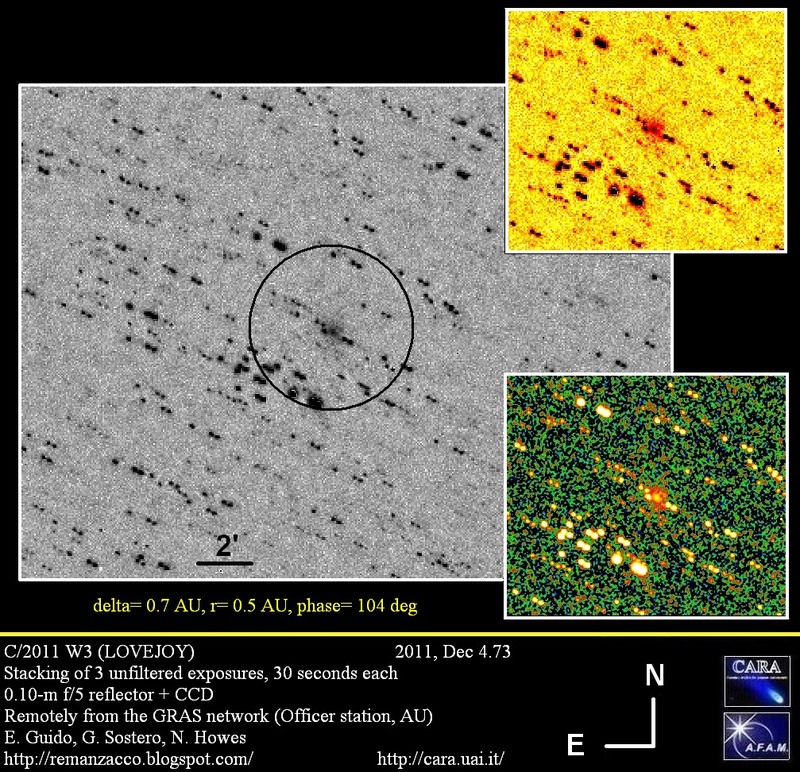 The new comet has been designated C/2011 W3 (LOVEJOY). 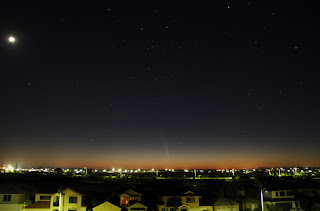 The comet appears to be a Kreutz sungrazer, a family of sungrazing comets that are named after German astronomer Heinrich Kreutz who first studied them in the details. 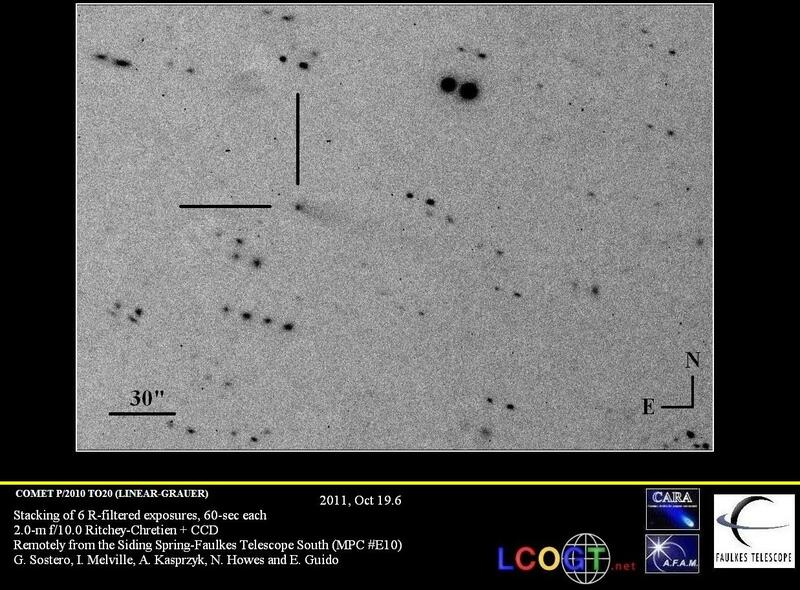 These comet fragments passes extremely close to the Sun at perihelion and usually they completely evaporated during such a close approach. 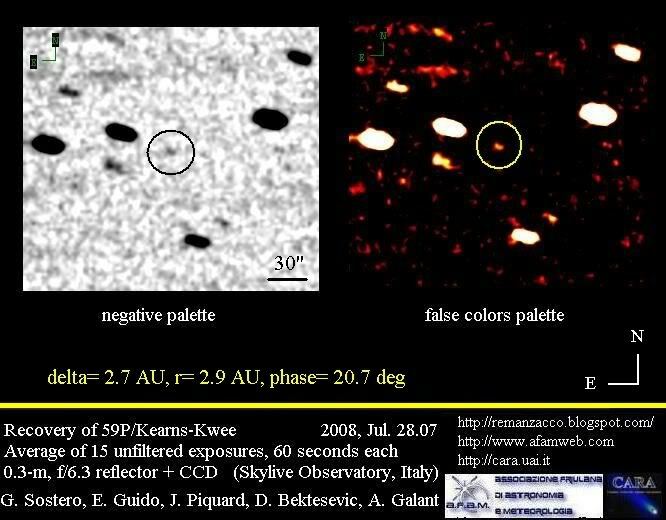 This is the first ground-Based discovery of a Kreutz Sungrazing Comet since 1970!! 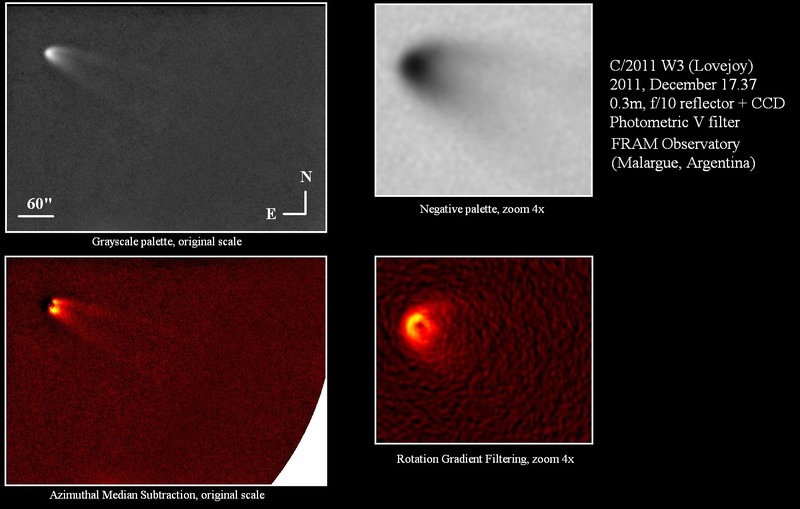 We performed some follow-up measurements of this object remotely from the GRAS Observatory (Australia - MPC Code E03) on 2011, December 04.7 through a 0.10-m f/5 reflector + CCD. Below you can see an animation showing the fast movement of the comet in the sky. Each frame is a 30-second exposure. Click on the thumbnail for a bigger version. 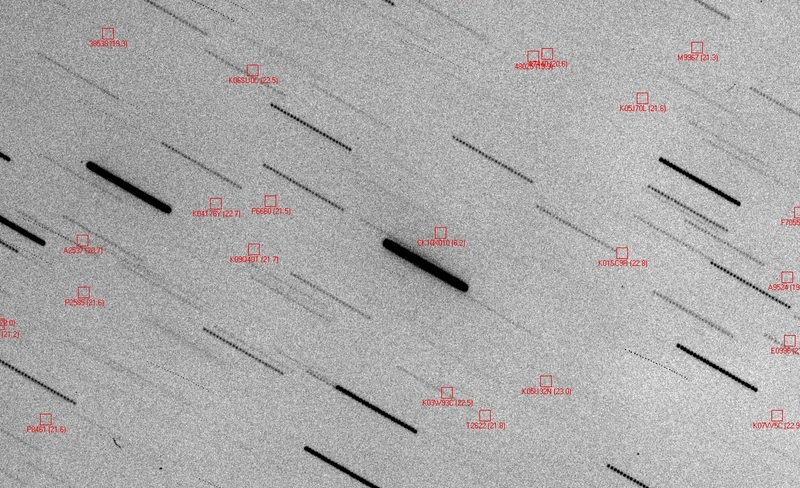 The comet is now rapidly brightening but seems intrinsically faint. It may not survive its close perihelion (at 0.0058936AU, which is a little over 1.2 solar radii) passage on December 16th that will bring it within 880,000 km of the center of the Sun (comet C/2011 W3 will pass just 180,000 km from the Sun’s surface). The following ephemeris (from Cbet 2930) assumes H = 14.0 and 2.5n = 8. 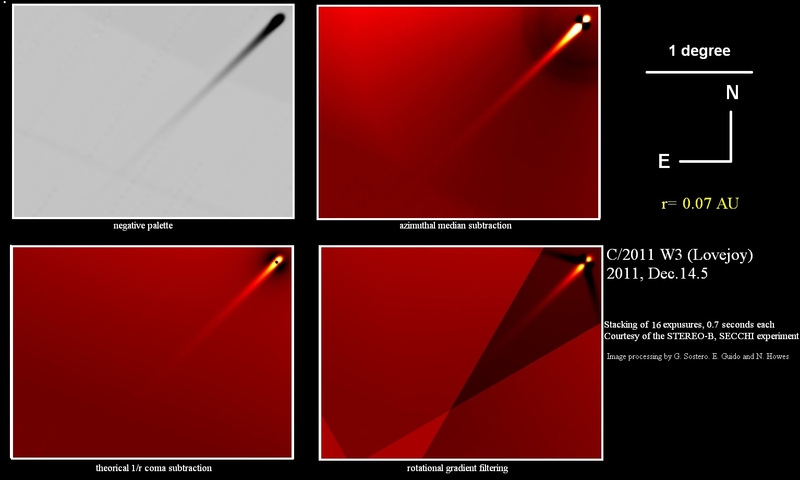 Note that the rate of brightness increase is highly uncertain. 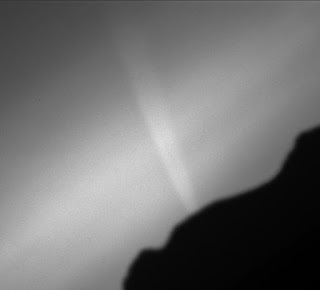 Extreme care is needed due to the comet's small solar elongation angle and close proximity to the Sun in the sky. Congrats to Terry Lovejoy his third comet discovery!! 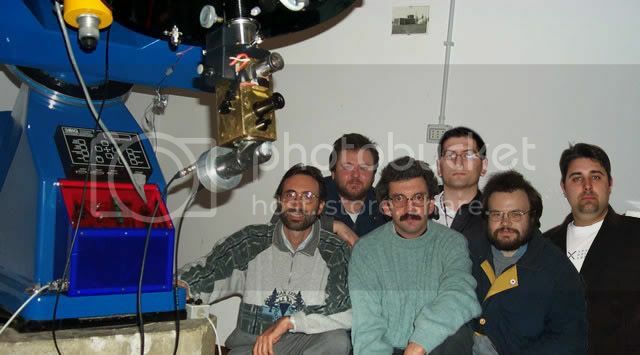 On comets-ml mailing list you can read the full discovery story written by Terry himself. M.P.E.C. 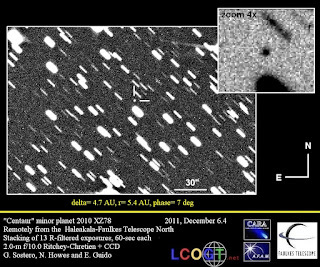 2011-W34, issued on 2011 Nov. 22, 02:33 UT, announced the discovery by Leonid Elenin (H15 ISON-NM Observatory, Mayhill) of a new unusual minor planet, with the temporary designation of 2011 RC17. At that time, its preliminary orbital solution provided a comet-like orbit, with a= 6.3 AU, e= 0.53, Incl. = 11.3 deg, and a period of nearly 16 years. 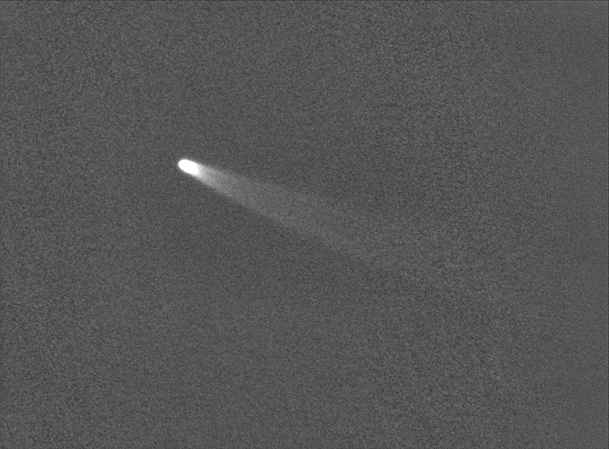 At first we observed this object on 2011 Nov. 22.4, remotely, through the Haleakala-Faulkes Telescope North 2.0-m f/10.0 Ritchey-Chretien + CCD. On our stacking it appearance was stellar, however we wanted to secure more images about it, in order to obtain a higher S/N, to make sure about its nature. 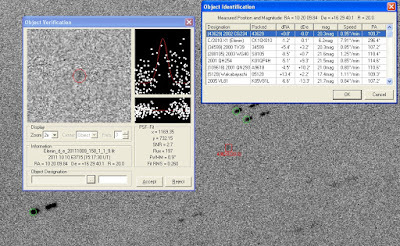 Then, on 2011, December 1.4, we were able to obtain another observing session through the Siding Spring-Faulkes Telescope South 2.0-m f/10.0 Ritchey-Chretien + CCD. 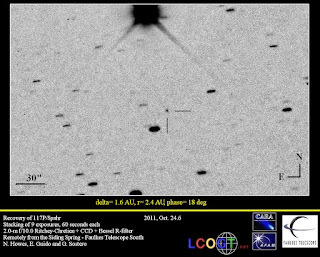 Stacking of 16 R-filtered exposures, 60-sec each, showed that this object had a stellar aspect, with its PSF profile being the same of the nearby field stars of similar brightness (FWHM of 1.4"). Cbet nr.2922, issued on 2011, November 29, announces the discovery of a new comet (discovery magnitude 17.9) by Claudine Rinner on CCD images obtained on November 28, 2011 taken with a 0.5-m f/3 reflector located at the Oukaimeden Observatory near Marrakech, Morocco. 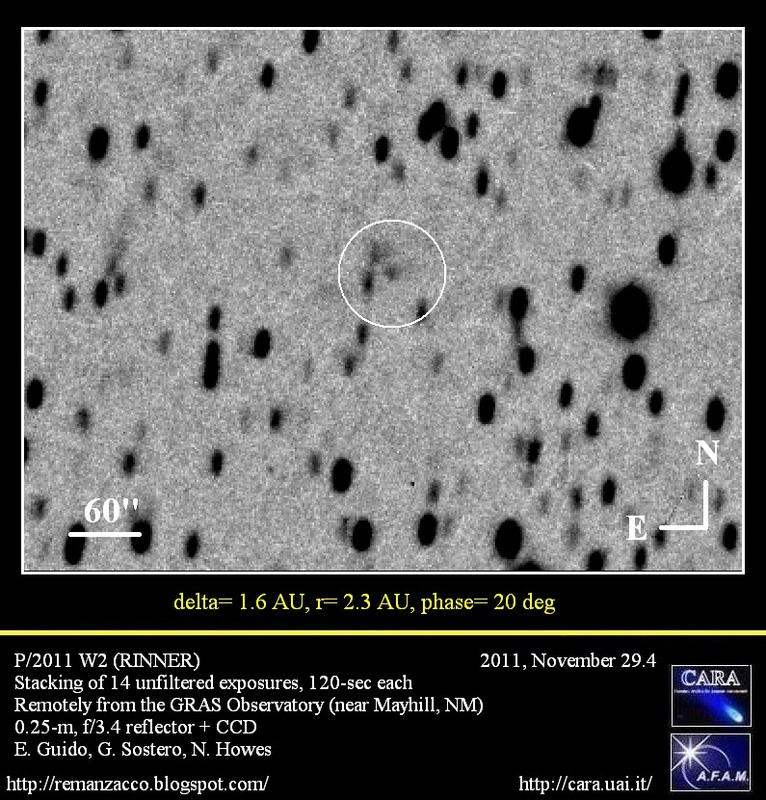 The new comet has been designated P/2011 W2 (RINNER). 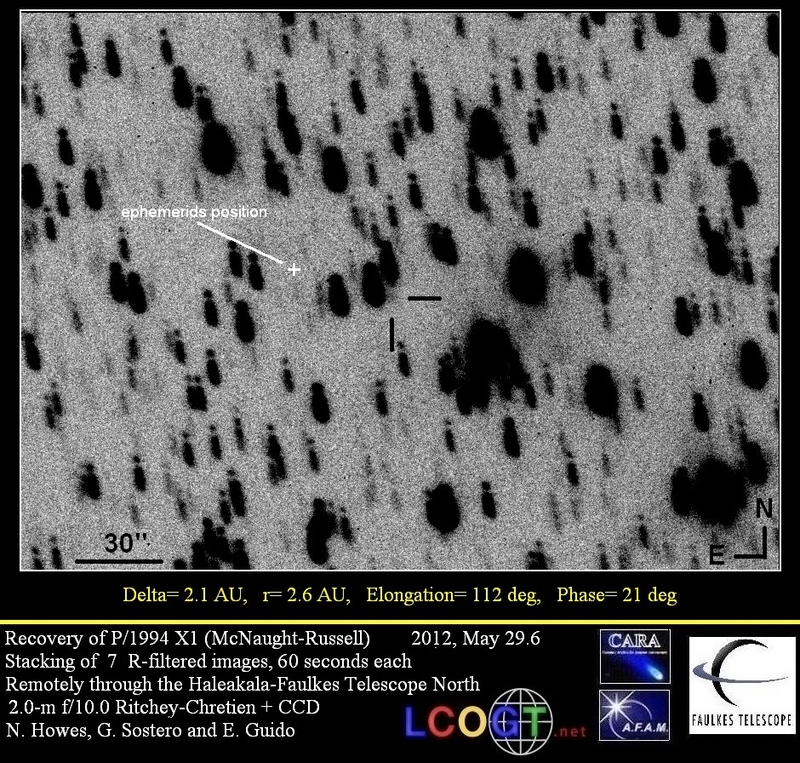 We performed some follow-up measurements of this object, while it was still on the neocp. 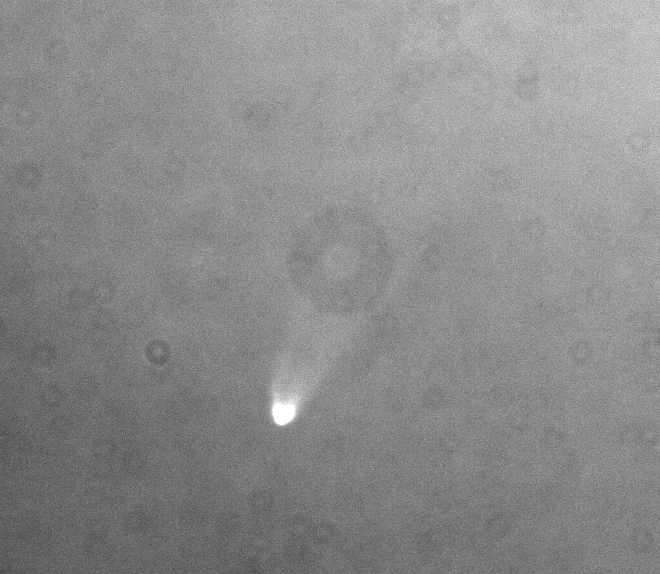 Stacking of 14 unfiltered exposures, 120-sec each, obtained remotely, from the GRAS Observatory (near Mayhill, NM) on 2011, November 29.3, through a 0.25-m, f/3.4 reflector + CCD, shows that this object is a comet: diffuse coma nearly 15-arcsec in diameter. 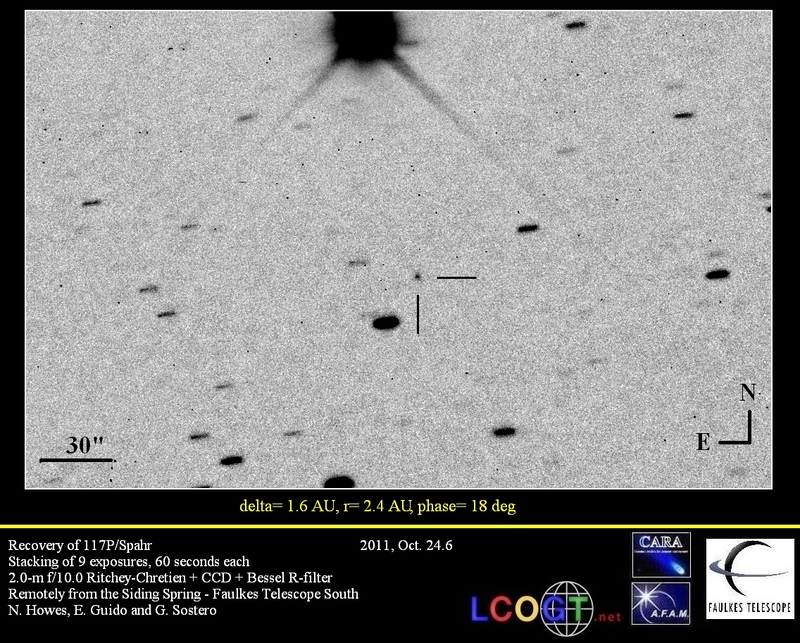 Congratulations to Claudine Rinner for this new amateur comet discovery!! Cbet 2923, issued on 2011, November 30, reports that an apparently asteroidal object reported by the Spacewatch survey and designated 2010 UH55 by the Minor Planet Center last year, has been found to show cometary activity. 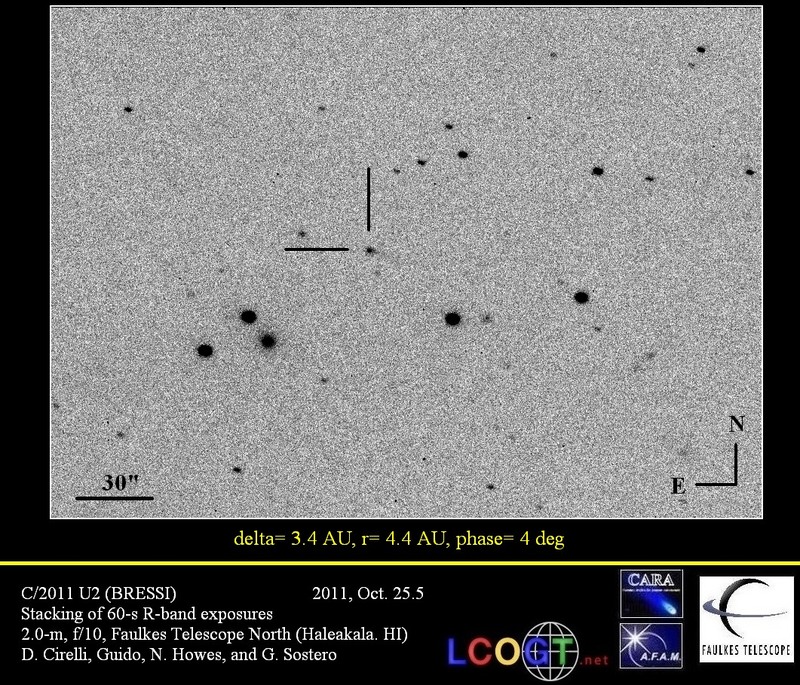 H. Sato (Tokyo, Japan) first reported the appearance of a condensed coma of size 6"-8" on 2010 Nov. 17.4 UT. Sato's report remained unconfirmed until the past month, when he again found the object on 2011 Nov. 3.5 to show a cometary appearance. 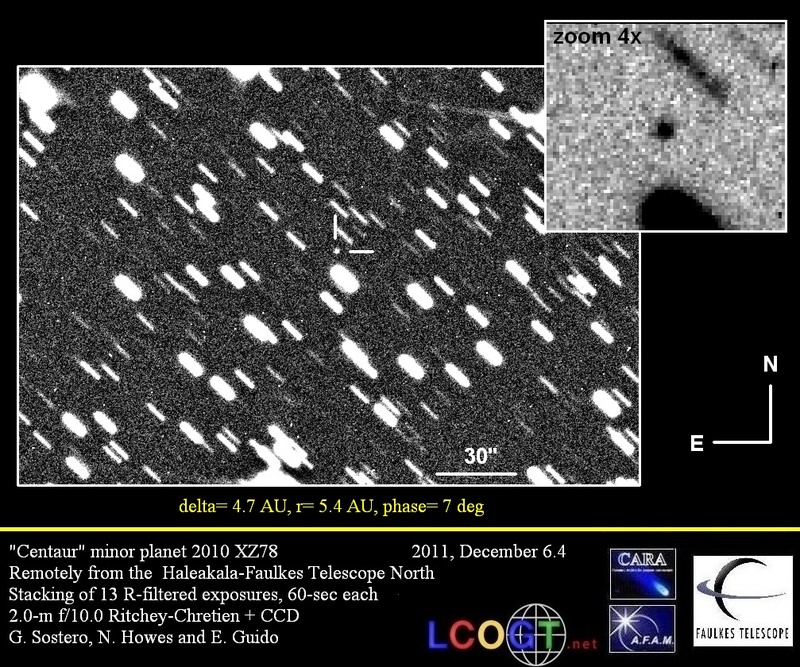 Other observers have confirmed the cometary nature of this object. 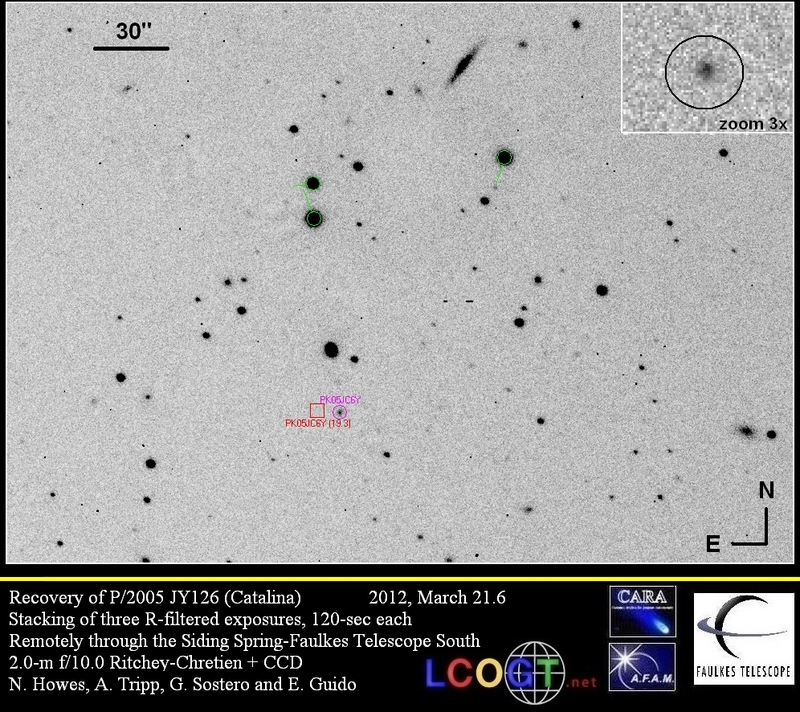 The new designation is P/2010 UH55 (SPACEWATCH). 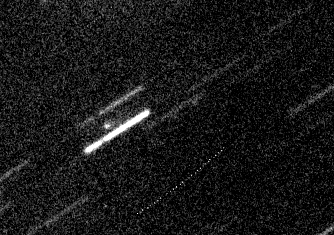 On November 08, 2011 at 23:28 Universal Time (UT), the Near-Earth asteroid 2005 YU55 passed within 0.85 lunar distances (or 319,000 km or 0.00217 AU) from Earth's surface. 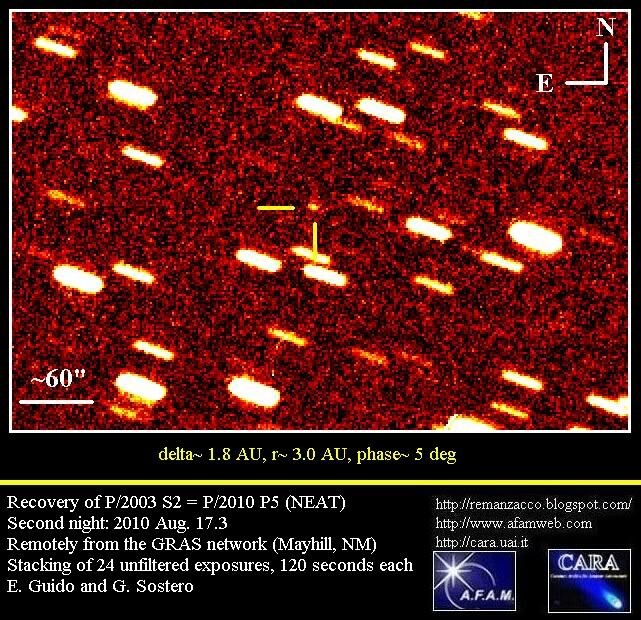 Asteroid 2005 YU55 was discovered by Robert McMillan during the Spacewatch survey on December 28, 2005. 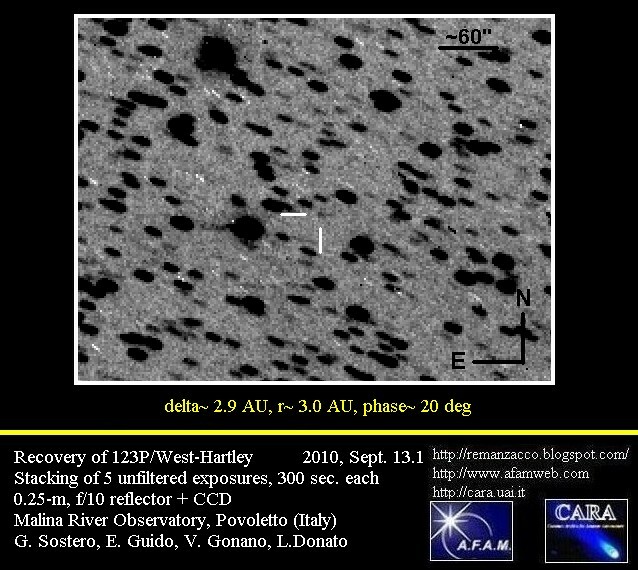 The 2011 approach is the closest that we know about in advance by an asteroid with an absolute magnitude this bright since 2010 XC15 (H = 21.4) approached within 0.5 lunar distances in 1976 (although astronomers did not know about this flyby at the time), and until 2028, when 2001 WN5 (H = 18.2) will approach within 0.65 lunar distances. 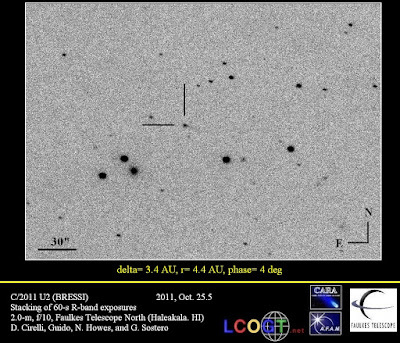 The object has been previously observed on April 2010 by Mike Nolan, Ellen Howell and colleagues with the Arecibo radar on April 19-21, 2010 and shown to be a very dark, nearly spherical object 400 meters in diameter with a relatively long rotation period, 18 to 20 hours. We have been able to follow-up this object on November 09.25 remotely from the GRAS Observatory (near Mayhill, NM) through a 0.25-m, f/3.4 reflector + CCD. 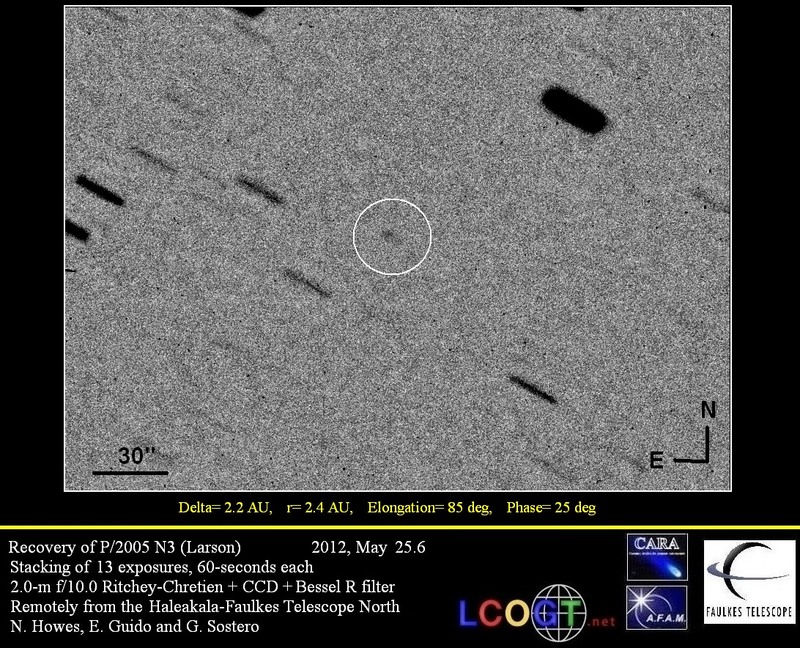 At the moment of our observing session the asteroid was moving at about 260.07 "/min and it was of magnitude ~11. The image below is a single 60-second exposure (click on it for a bigger version). Due to its size and proximity to Earth, the Minor Planet Center has designated 2005 YU55 as a "Potentially Hazardous Asteroid". 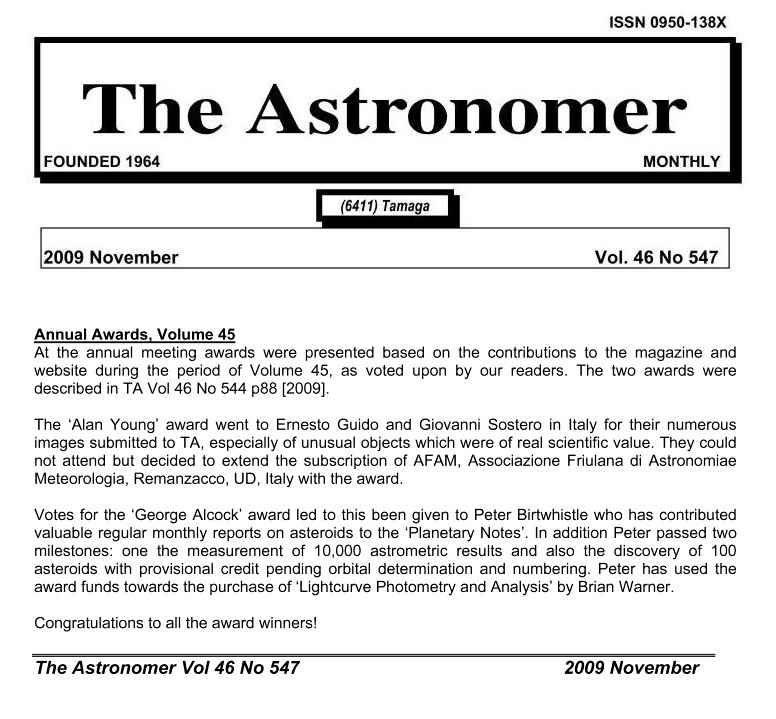 Although classified as a potentially hazardous object, 2005 YU55 poses no threat of an Earth collision over at least the next 100 years, the entire interval over which its motion can be computed reliably.